A quartet of former Artesia High School thespians is reprising one of their favorite productions next month in celebration of their 10-year reunion. 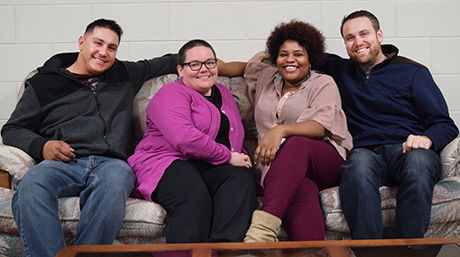 Class of 2009 graduates Russ Panzer, Kandese Green, Isaiah Mendoza and ZoeAnn Smith will join eight other local actors in staging “Harvey,” the comedic tale of Elwood P. Dowd and his presumably imaginary friend, Harvey the Rabbit. The play was notably adapted into a 1950 film starring Jimmy Stewart. Director Sandy Schuetz says Panzer was reminiscing with former classmates during a September rehearsal for an Artesia Community Theatre production when he approached her with the idea and the request she direct. Schuetz, who helped with the students’ first staging of the play, recalls AHS Drama’s 2009 production of “Harvey” as “a huge success” and says she is looking forward to joining “the original four” in its reprisal. The cast is currently rehearsing at First Christian Church and plans to dedicate the February production to the memory of James Moore, who portrayed Judge Omar Gaffney in the 2009 high-school performance, and longtime ACT member Laney Rountree. Panzer will be performing the role of Dowd, with Green acting as Myrtle Mae Simmons, Mendoza as Lyman Sanderson, M.D., and Smith as Veta Louise Simmons. Joining them will be Joyce Munoz (Miss Johnson), Glenna Brady (Mrs. Ethel Chauvenet), Gayathry Abraham (Ruth Kelly, R.N. ), James Bennett (Duane Wilson), Jim Schuetz (William R. Chumley, M.D. ), Joyce Munoz (Betty Chumley), Harold Bennett (Judge Gaffney) and Kim Bennett (E.J. Lofgren). The comedy in three acts will be presented at 7 p.m. Friday and Saturday, Feb. 1 and 2, and 2 p.m. Sunday, Feb. 3, at the Ocotillo Performing Arts Center. Tickets are $15 for adults, $10 for students in grades K-12, and may be purchased in advance by contacting Reginia Garner at 365-8713.